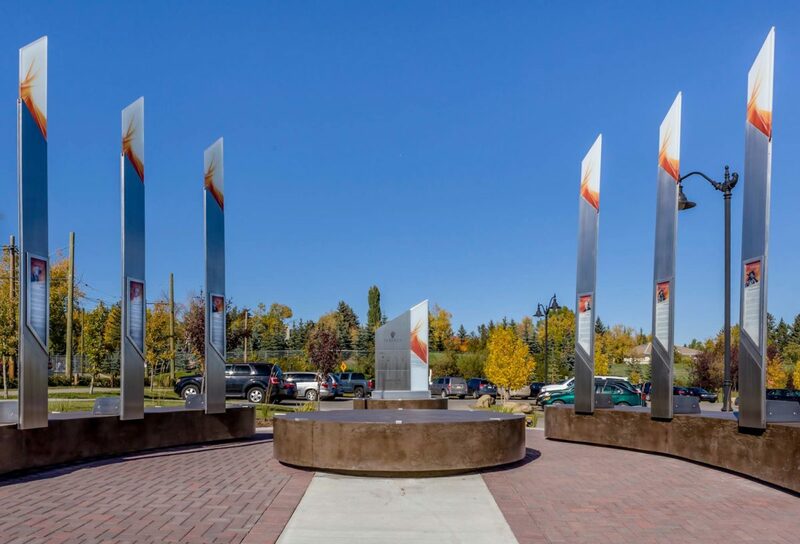 The Fields of Fame are groupings of structural steel, architecturally designed which are placed at prominent locations throughout the city to commemorate the accomplishments of those Calgarians who have made a lasting contribution to Calgary. Each Field of Fame includes six steel “sheaves of wheat”, thirteen feet high, symbolic of the prairies and the farm and ranching culture that formed the early backbone of the Calgary area. Each sheaf of wheat includes a brief history on the individual being honoured, with a photograph and wording designed to highlight the import and significant contribution made by the particular individual to the fabric of the Calgary community. They will be artistic monuments of the quality befitting the opportunity to honour these citizens who were so important to Calgary’s past. The Fields of Fame will preserve Calgary’s history, making it accessible to the average Calgarian in numerous locations around the city. They will also serve as an inspiration to our youth as they too look to make their own unique contribution to our community in the future.